The new Greenways are envisioned to be very efficient routes for bicycle commuting, but they’re also designed to be much more than that. Modeled on other popular linear parks, the Greenways would be attractive places to go for a stroll, walk a dog, or hike to the nearest ballfield. The many parks in the Twin Cities are already recognized as among the best in the country, and by linking dozens of parks and trails into a regional network of Greenways, the park system would be profoundly enhanced and expanded. The five maps below outline how the new Greenways would fit with the existing trails. 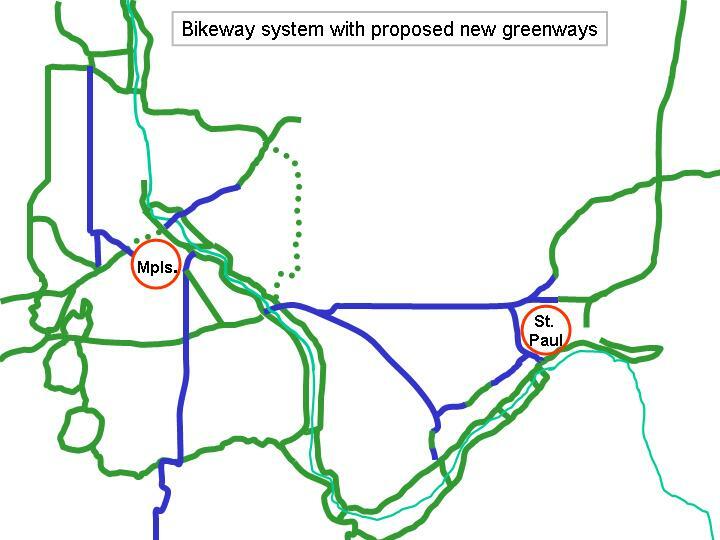 The first map, just below this text, shows the existing trails in green, and the proposed new Greenways in blue. The maps below are MUCH easier to read – this busy image is provided simply to show the context: Minneapolis and St. Paul are shaded in yellow, and the suburbs are white. Now for something a little easier to look at. 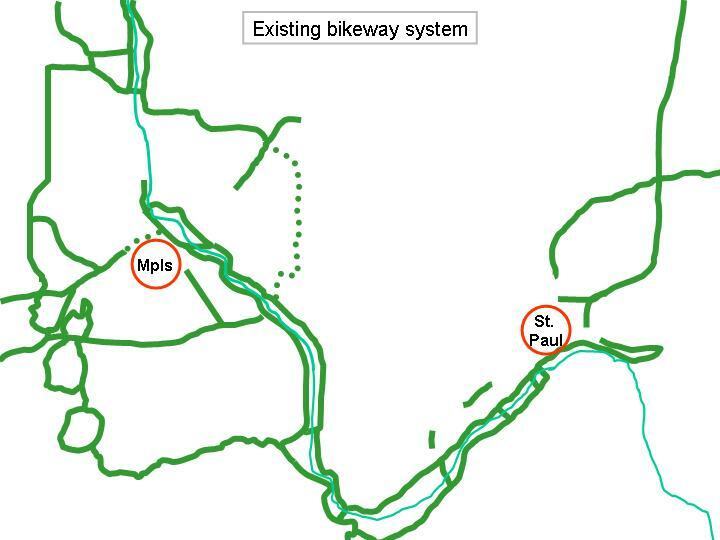 This map again shows the existing trails in green, and the proposed new Greenways in blue. 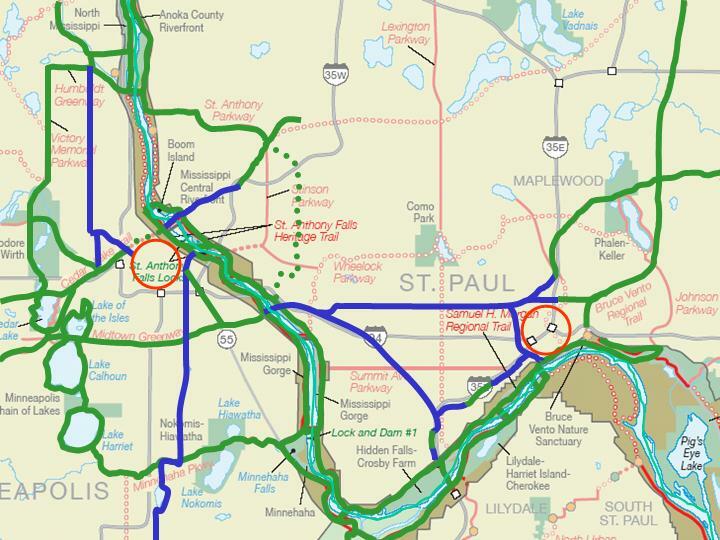 Red circles represent downtown St. Paul and downtown Minneapolis. This map shows only the existing trails. It’s a very important map, because it shows just how much has already been accomplished. This map shows where you can always find someone out for a walk or a run. It’s a big piece of why the Twin Cities are a great place to live. And it helps explain why Minneapolis is ranked #2 nationally in the percentage of commuters who go by bike (3.8%). This map also shows where the system could use more connections. The map below is the same as the map above, but with the new Greenways shown in blue. 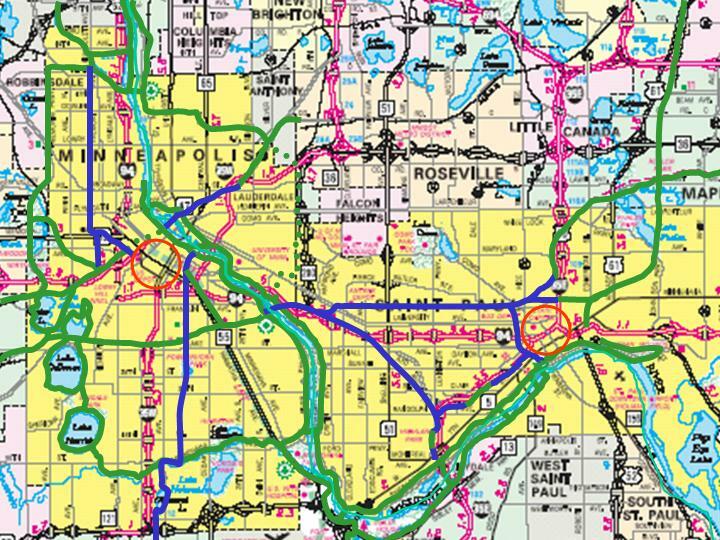 With the new Greenways in place, there’s a convenient way to get from Frogtown to Downtown Minneapolis. There’s a direct route from South Minneapolis to Downtown St. Paul and the Gateway Trail. Cedar Lake Trail connects to the Northeast Diagonal Trail, and North Minneapolis gains a park amenity and a much needed pedestrian/cyclist connection to Downtown. 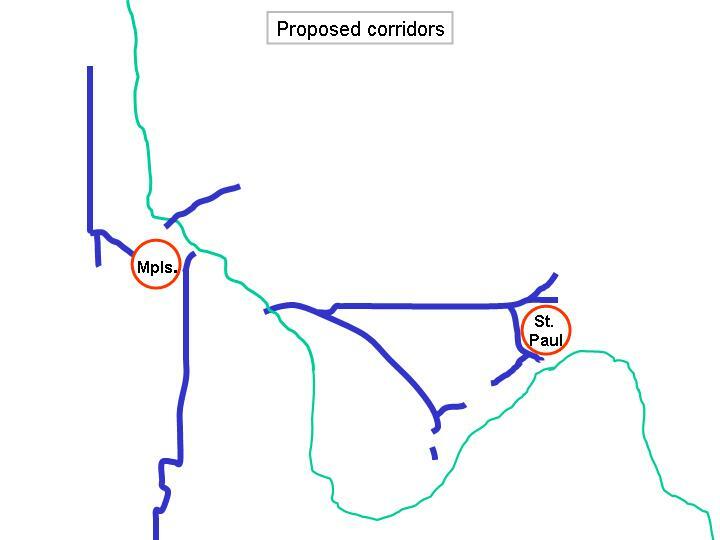 The point of this last map is that the missing links, shown in blue, are small compared with the existing infrastructure in place. With a few more corridors, we’ll have a more logical, functional system, building from the excellent starting point we currently enjoy.